What a grand and unique opportunity to step into one of Louisville's most storied institutions, the RUDYARD Kipling. This building could be made into condominiums,live/work space, live/event, bed & breakfast, short-term rental units or possibly a bar or restaurant. This property has recently undergone a long list of extensiverenovations, remodeling including: Brand new plumbing, new electrical, new high efficiency HVAC (heating and cooling), custom gourmet kitchen with 13 foot kitchenisland, floating wall pantry, black concrete counter top, Stainless steel refrigerator and Verona commercial stove, double farmhouse style sink, Reclaimed antiquewood kitchen shelves and original Rudyard Kipling foot railing!The main hall would make an excellent dining room for a restaurant/brewery/micro-distillery, Board room, Event space, bed & breakfast common area or living/dining room for you and your guests! You'll also find refinished wood floorings, 13x8 ft movie screen and projector and beautiful, turn-of-the-century beams. Upstairs you will find 5 bedrooms, complete with Master suite with platform area, HUGE walk through closet with antique wood double doors, and a Master bath with double shower heads, leaded glass doors, new tile and a 90 gallon bathtub. It is absolutely STUNNING! Upstairs also has a laundry room (convenient for air bnb or a myriad of other tenants. Plumbing could also be used to make another bathroom if needed). There is exposed brick and refinished heart pine throughout and the ceilings have even been spray foam insulated for energy efficiency! Out back you'll find the yard with gated parking lot (approximately 10 parking spaces). Over a century of tradition and history fill this 19th century property with romance and legend. First constructed as a residence (farmhouse), this property became a popular neighborhood tavern and gathering place later. 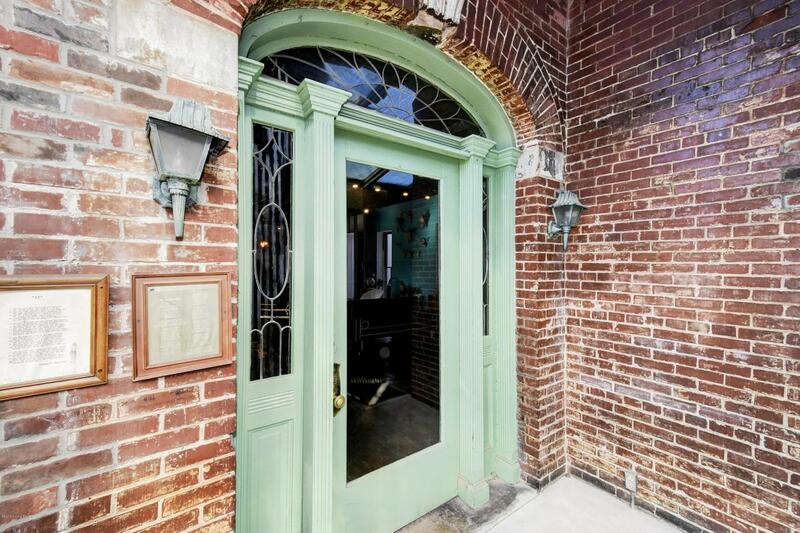 Located in the heart of Historic Old Louisville Business District! Listing provided courtesy of Fry Realty Collective. © 2019 Metro Search, Inc. All rights reserved.